device consisting of a sealed enclosure in which electrons flow between electrodes separated either by a vacuum (in a vacuum tube) or by an ionized gas at low pressure (in a gas tube). A framework of parallel, crisscrossed lines or bars forming a pattern of uniform size; sets of intersecting members on a square or triangular matrix, which make up a three-dimensional structural system. A network of power transmission and distribution facilities used to provide electricity to users such as homes, businesses, and industry. Large power plants, wind-power-generating facilities, and small power producers such as photovoltaic farms feed electrical power into the grid for distribution to users. In optical character recognition, a system of two groups of parallel lines, perpendicular to each other, used to measure or specify character images. A network of equally spaced lines forming squares, used for determining permissible locations of holes on a printed circuit board or a chassis. A metal plate with holes or ridges, used in a storage cell or battery as a conductor and a support for the active material. Any systematic network, such as of telephone lines or power lines. An electrode located between the cathode and anode of an electron tube, which has one or more openings through which electrons or ions can pass, and serves to control the flow of electrons from cathode to anode. A system of uniformly spaced perpendicular lines and horizontal lines running north and south, and east and west on a map, chart, or aerial photograph; used in locating points. Imaginary line used to divide the surface of an area when following a checkerboard placement of boreholes. 3. In surveying, closely-spaced reference lines which are perpendicular to each other; elevations usually are taken at the intersections of these lines. A GEOREFF grid. This is superimposed on map. i. The system of two sets of parallel lines uniformly spaced and crossing at 90° to each other to form a pattern of squares. This grid is designed so that any point on the map can be designated by its latitude and longitude or by its grid coordinates, and a reference in one system can be converted into a reference in another system. 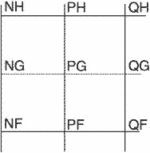 Such grids are usually identified by the name of the particular projection for which they are designated. See universal transverse Mercator's grid. ii. The electrodes in an electron tube between the cathode and the anode that permit and direct the passage of electrons or ions. iii. Two sets of mutually perpendicular lines dividing a map or chart into squares or rectangles to permit the location of any point by a system of rectangular coordinates as in a military grid, world geographic reference system, or GEOREFF. See GEOREFF. iv. Pertaining to or measured from a reference grid, such as a grid azimuth, grid latitude, or grid meridian. (1) Any interconnected set of nodes such as the electric power network or a communications network. (2) "The Grid" is a nickname for Internet2. See Internet2. (3) In a vacuum tube or gas-filled electron tube, the grid is a perforated electrode through which electrons may pass. The term typically refers to the control grid in a triode, tetrode or pentode vacuum tube. In these cases, the grid is used to control the amount of current flow between the cathode and plate (anode). As the voltage potential is varied on the control grid, the amount of current allowed to pass through also varies. Relatively small fluctuations in the grid's potential can control substantially larger amounts of current flow through the tube. This phenomenon is referred to as "gain." Tetrodes and pentodes use additional grids to regulate current flow and effect gain. See screen grid and suppressor grid.